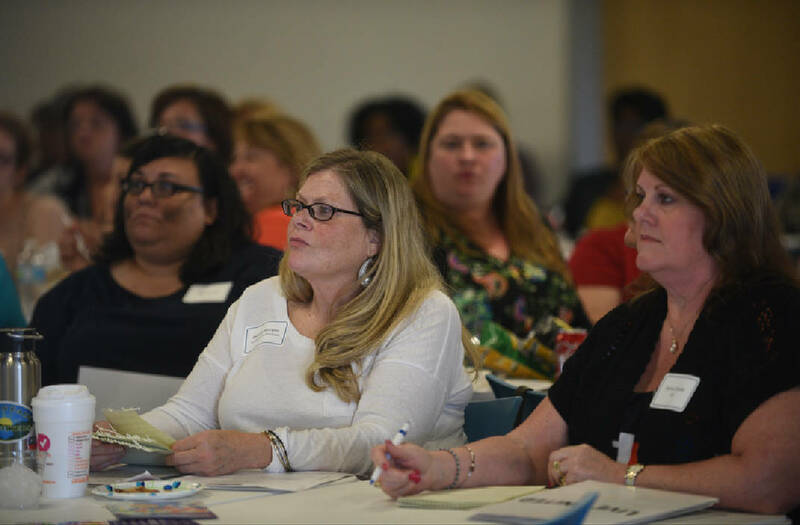 Donna Shields, right, and Belinda Morgan listen as Dr. Pat Levitt speaks Monday, May 1, 2017 during the ACEs Community Summit at the Family Justice Center. We learn how to be good — or bad — at a very early age, and any effort to improve public education, reduce crime or improve health care must begin almost at birth. That's the message of a two-day program focusing on adverse childhood events, or ACEs, the traumatic experiences that can warp a baby's emotional and physical development. "Brains build over time from the bottom up, skills beget skills," said Dr. Pat Levitt, an expert at the University of Southern California and at Children's Hospital in Los Angeles, on how experience and genetics shape the brain. "For children and infants and toddlers and adolescents, this is critical," Levitt told a lunchtime forum of doctors, nurses, child welfare advocates and educators. If infants don't have interaction with adults and their environment early on, critical connections and pathways in the brain fail to form, Levitt said, and the baby's emotional and physical health may be stunted. Dr. Pat Levitt speaks Monday, May 1, 2017 during the ACEs Community Summit at the Family Justice Center. The process begins early. At 16 months, there is no difference in most children's understanding of language, no matter what their socioeconomic condition. But by 36 months, the gap is tremendous between those children raised by college-educated parents versus those who are working class or on public assistance, based on "hearing words in the context of life going on around them," Levitt said. Chattanooga pediatrician Dr. Allen Coffman, president of the Pediatric Health Improvement Coalition for the Tennessee Valley, said his group surveyed the metro area to determine in what ZIP codes children were most likely to face adverse childhood experiences. The top five — Highland Park, East Chattanooga, East Lake, South Brainerd and Alton Park — closely tracked the neighborhoods where the city's gang violence is highest, neighborhoods with a high percentage of single parent families, low education and high unemployment or underemployment. What some infants miss is what researchers call "serve and return" interactions, where a child makes a face or coos at an adult and the adult responds in a positive way, Levitt said. The more that happens, the more the child is encouraged to continue the activity and learn how to interact with adults, other children, and their environment. When it's absent, children often have high stress levels that can result in physical consequences. A long-term study of a group of almost 1,000 people over 40 years found a link between high blood pressure and the quality of early childhood education they received, Levitt said. Parental neglect is actually much more harmful to a child than physical abuse, Levitt said. "The regular absence of care from adults sets the stress response system permanently on high alert," he said. "Areas of the brain dedicated to learning and reasoning are weaker and fewer in number." The United Way, the Regional Health Council and the Chattanooga- Hamilton County Medical Society are sponsoring meetings, which include a public discussion today from 5:30-7 p.m. at Memorial Auditorium. Organizers hope to help local child welfare, education and health care groups to coordinate their efforts to better detect children who are vulnerable to adverse childhood experiences. In his research, Levitt said, his team has been trying to determine if a simple two-minute monitoring of what an infant is looking at can develop patterns that would wave a red flag. "What infants pay attention to and for how long is important," he said. If problems are seen, "pediatricians can start looking to see if we need a better intervention." One issue child welfare professionals face is that the parents themselves often do not have adult skills, Coffman said. "The kinds of programs we are doing involve adult capacity building, watching the interactions between a young parent and child," he said. "We don't spend a lot of time saying, 'Don't do this,' we spend more time saying, 'Do this more.'" This week's programs are part of the state of Tennessee's Building Strong Brains initiative. Contact staff writer Steve Johnson at 423-757-6673, sjohnson@timesfreepress.com, on Twitter @stevejohnsonTFP, and on Facebook, www.face book.com/noogahealth.